Since the public disgrace of the closure of the Redgrave in 1998, the long campaign to have theatre restored in Farnham is winning through. 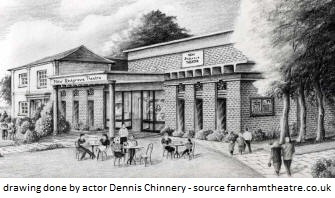 The Farnham Theatre Association is an organisation which is fighting to save The Redgrave Theatre (1974-1998) from demolition. They’re working for a community theatre. To support the Association, you can get a FTA MEMBERSHIP which will enable you to read their newsletters! New year begins March. Please send cheques to: The Treasurer, c/o 4 Nutshell Lane, Upper Hale, Farnham GU9 0HG. I hope they succeed! Please give your contribution. I steal from the fansite a photo from Traitors episode one: Luke Treadaway and behind him Jack Holden and Edward Bluemel. I feel lucky I saw all three of them on stage and got to meet two! #YardTheatre #London @theyardtheatre casting announcement for #TheCrucible, 27 March - 11 May 2019! Includes Jack Holden! Yay! It's a pity it didn't take the red and purple in the right way! My photo doesn't pay this sky justice! It's stunning! Here how Ben Daniels could look like in #JupitersLegacy! He is perfect for the role! Did they draw him knowing he was going to play him, one day? #JupitersLegacy on Netflix #BenDaniels @bendanielsss will play Walter Sampson, aka Brainwave, a loner who can create psychic illusions that serve him well in combat. He's a doting uncle to Chloe and Brandon, but he has a strained relationship with his headstrong brother, Sheldon. I'm already intrigued by this character!! !